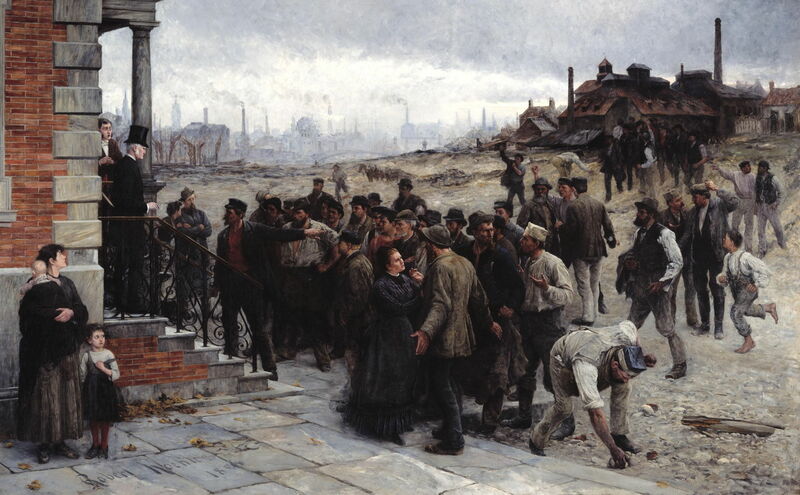 Robert Koehler (1850–1917), The Strike in the Region of Charleroi (detail) (1886), oil on canvas, 181.6 × 275.6 cm, Deutsches Historisches Museum, Berlin, Germany. Wikimedia Commons. Many, perhaps most, artists have come from the working classes, and painted largely for the wealthy. In times of social unrest, they were faced with difficult choices. Had they taken up the social cause in their art, they would have risked the patronage which had enabled them to break free of their humble origins. This changed with the French Revolution, when David, for example, became involved with the same revolutionaries who executed his former patrons, whose portraits David had painted a few years earlier. 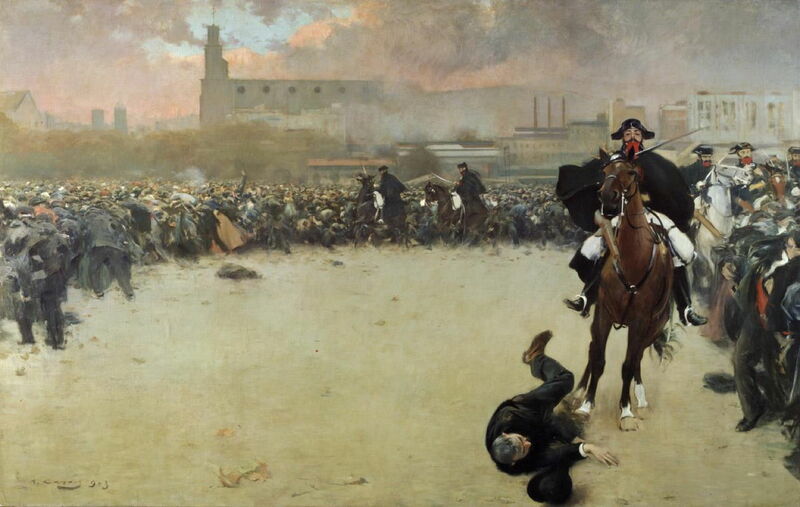 Artists also felt more able to depict some of the horrific attacks on the public, for example during the Paris Commune in 1871. The nineteenth century was a period of great social unrest throughout Europe. With the rise of cities and industrialisation, the urban poor were in even greater distress than those in the country, while those who owned factories and businesses became obscenely rich at their expense. Social inequality drove movements aimed at ending such injustice, including those to improve the rights of workers. Strikes broke out in many of the poorest areas, such as the coalfields in the north-east of France and nearby Belgium. 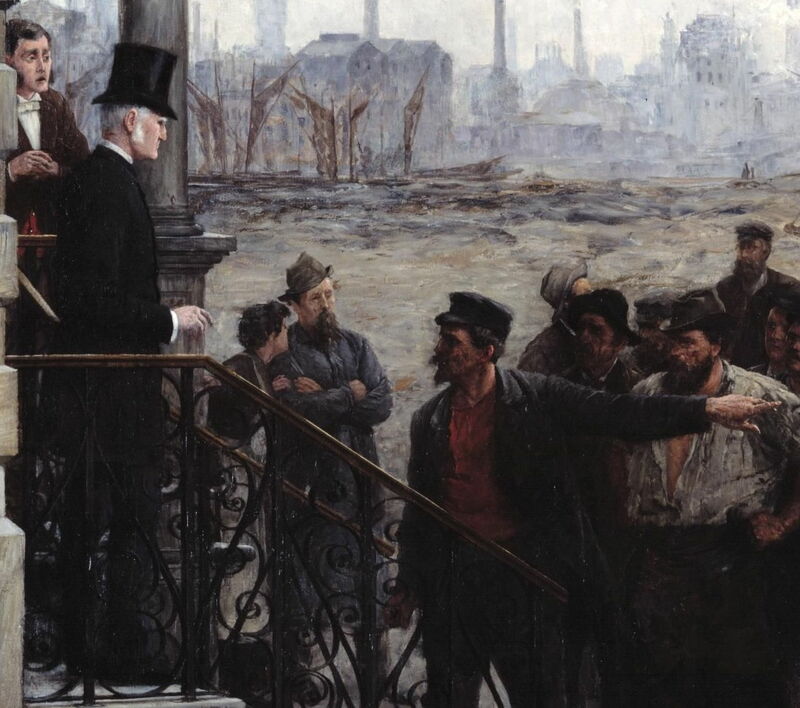 One of the first prominent paintings of a strike appears to be Alfred Philippe Roll’s Miners’ Strike, which was exhibited in the Salon of 1880 (or perhaps the following year). It is most probably based on a strike at Denain in the Nord-Pas de Calais coalfield of that year. It shows the desperate and increasingly worrying gathering of striking miners and their families. A woman is restraining one man from throwing a rock at the pithead buildings. Most of those present are barefoot. Mounted soldiers or police are present, handcuffing one of the strikers. Roll agreed to sell his painting to the state at cost price, on the understanding that it would hang in the Ministry of Commerce, but he was tricked and it was sent instead to the local museum in Valenciennes, where it would bring less embarrassment. It has since become badly damaged, and is now only known from this reproduction, printed in Le Petit Journal of 1 October 1892. 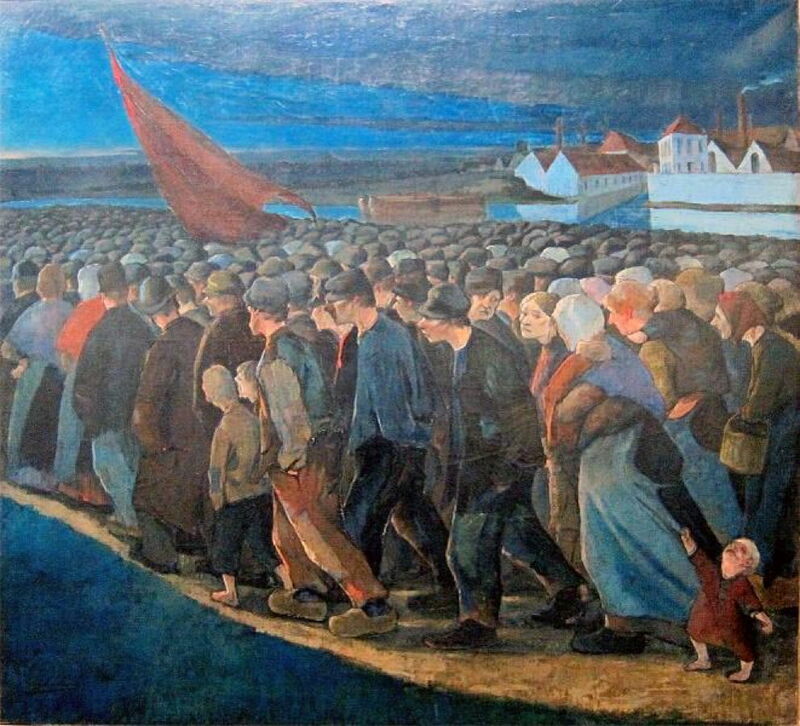 I have argued that this painting may well have influenced Émile Zola when he was preparing to write his novel Germinal, about a miners’ strike in the Nord-Pas de Calais coalfield similar to that painted by Roll. This painting and Zola’s novel also appear to have inspired a series of Naturalist works showing other strikes across Europe. Robert Koehler (1850–1917), The Strike in the Region of Charleroi (1886), oil on canvas, 181.6 × 275.6 cm, Deutsches Historisches Museum, Berlin, Germany. Wikimedia Commons. Robert Koehler’s masterpiece of The Strike in the Region of Charleroi was made in 1886, the year of a succession of strikes across Belgium. These started in Liège as a commemoration of the fifteen anniversary of the Paris Commune, but spread through industrialised zones to the region around Charleroi and Hainault. Koehler shows a group of workers standing outside the smart entrance to offices (detail below). The top-hatted owner stands on the top step, one of his managers looking anxious beside him. The leader of the workers is at the foot of the steps telling the industrialist of the workers’ demands. Wives in the crowd are remonstrating with their husbands, one demonstrator is picking up a rock to use as a projectile, and at the far left is a young wife with her two children, looking anxiously at the proceedings. The situation is looking increasingly nasty, although there are no signs yet of police or troops, or of violent confrontation. The strikes of 1886 led to the formation of a parliamentary socialist party in Belgium, and increasing industrial strife. This came to a head in 1893, when there was a general strike called by the Belgian Labour Party in a demand for universal male suffrage. It has been claimed that this was the first such general strike in Europe. Eugène Laermans (1864–1940), An Evening’s Strike, or The Red Flag (1893), oil on canvas, dimensions not known, Koninklijke Musea voor Schone Kunsten van België / Musées Royaux des Beaux Arts de Belgique, Brussels, Belgium. Wikimedia Commons. The general strike was called to start on the evening of 11 April, and is depicted in Eugène Laermans’ An Evening’s Strike, or The Red Flag (1893). Instead of Koehler’s small group of workers, the whole population, men, women and children, are on the march, and the distant factories have fallen silent. Artist not known, The Riots of Mons (c 1893), illustration published in Le Petit Journal, May 1893, dimensions and location not known. Wikimedia Commons. 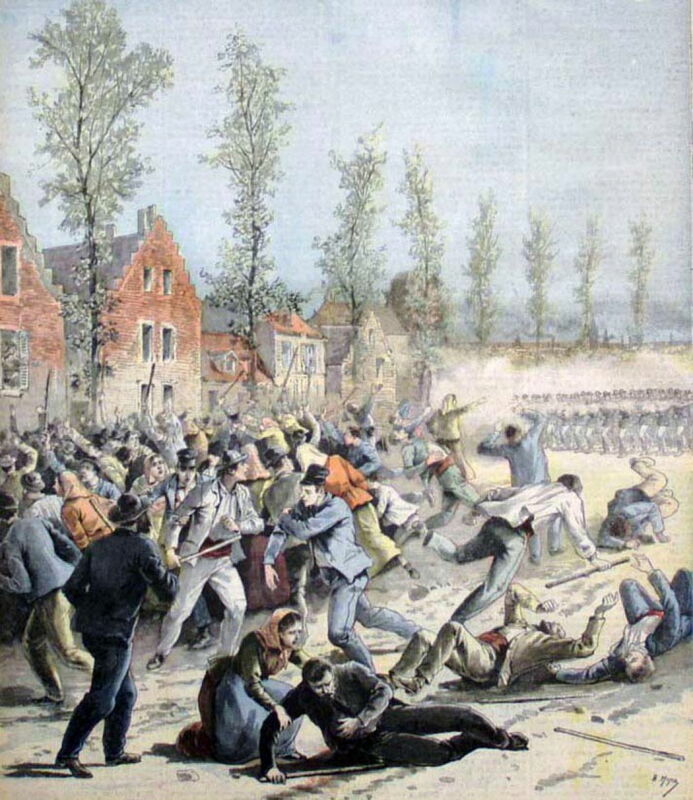 The Belgian government tried to quell growing clashes between strikers and troops, which by the 17 April led to The Riots of Mons shown here in an anonymous illustration published in Le Petit Journal the following month. The artist here concentrates attention on the civilian casualties. Between 13 and 20 civilians were apparently killed, here by the Civil Guard shown in the right background. The following day the government acceded to the demands, and the strike ended. Strikes were prominent in other European countries at the time, including regions of Spain. In the Spring of 1892, workers in Valladolid, in north-western Spain, came out on strike. 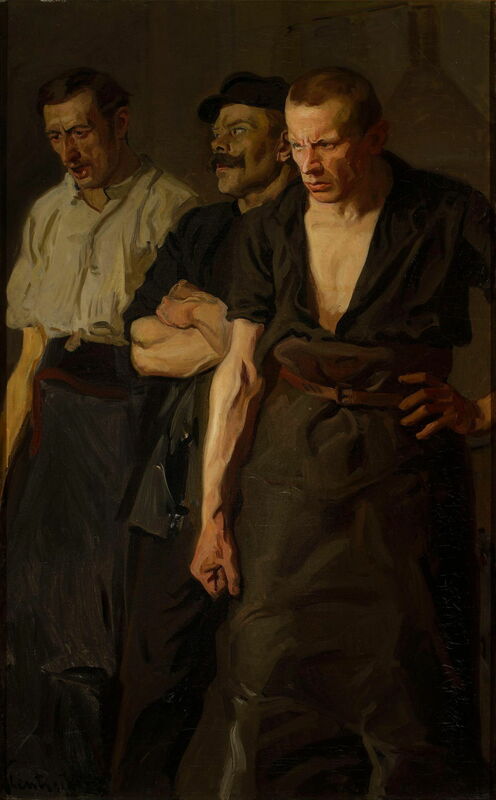 José Uría y Uría (1861–1937), After a Strike (1895), oil on canvas, 250 x 380 cm, Museo de Bellas Artes de Asturias, Oviedo, Spain. Wikimedia Commons. 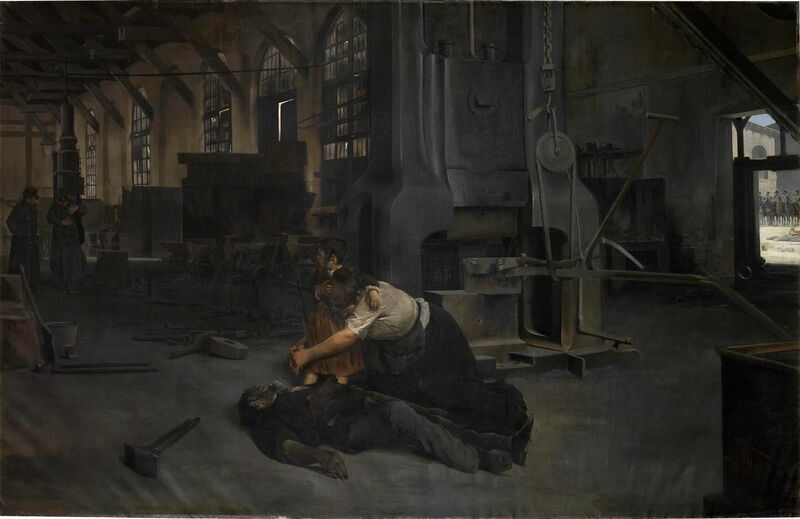 José Uría y Uría’s painting After a Strike from 1895 is quite different from those above, in showing the inside of one of the factories. In the foreground, a worker lies apparently dead, his wife and young daughter grieving beside his body. Next to him is a large forge hammer, which was presumably the cause of his death. In the distance on the left are two policemen or civil guards, one of whom is comforting an older daughter. An opening in the factory wall at the right edge shows mounted forces outside. The likely reading is that the worker shown was killed during the violence of the strike, which has now been suppressed by troops. This is a far more personal and intimate impact than depictions of large groups and crowds. Ramon Casas i Carbó (1866–1932), The Charge, or Barcelona 1902 (1903), oil on canvas, 298 x 470.5 cm, Museu de la Garrotxa / Museu Nacional d’Art de Catalunya, Olot, Spain. Wikimedia Commons. Ramon Casas i Carbó’s The Charge, or Barcelona 1902 was dated by him in 1903, but is thought to have been started in 1899. It refers, though, to a strike which took place in Barcelona in 1902, so remains something of a mystery. It shows a rider of the Civil Guard trying to avoid running over a member of the crowd, during a violent confrontation. 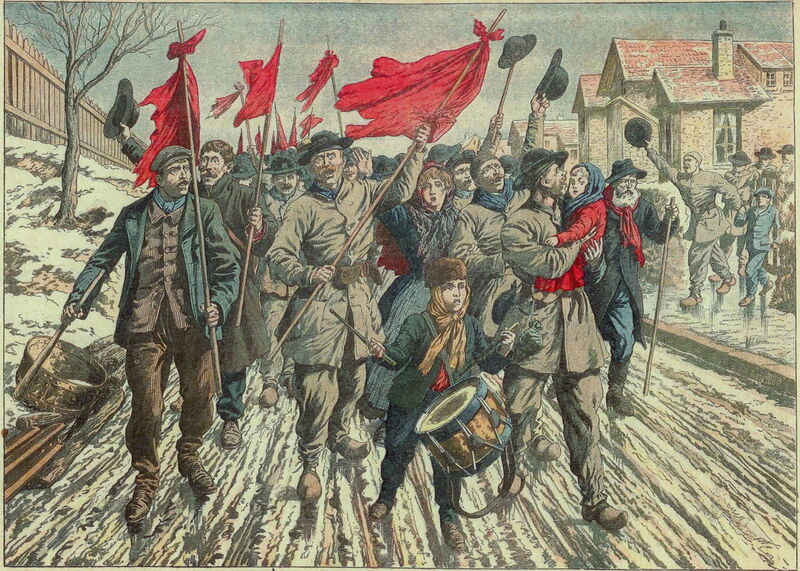 Artist not known, The Miners’ Strike in Pas-de-Calais (c 1906), illustration published in Le Petit Journal, 1 April 1906, dimensions and location not known. Wikimedia Commons. Another fine anonymous illustration from Le Petit Journal of 1 April 1906 shows continuing unrest in the French coalfields, here in The Miners’ Strike in Pas-de-Calais. Attention is drawn to the increasing strength and politicisation of strikers and their families, as they stride forward under numerous red banners – and the growing socialist movement across Europe. Stanisław Lentz (1861–1920), Strike (1910), oil on canvas, 118 x 74 cm, Muzeum Narodowe w Warszawie, Warsaw, Poland. Wikimedia Commons. 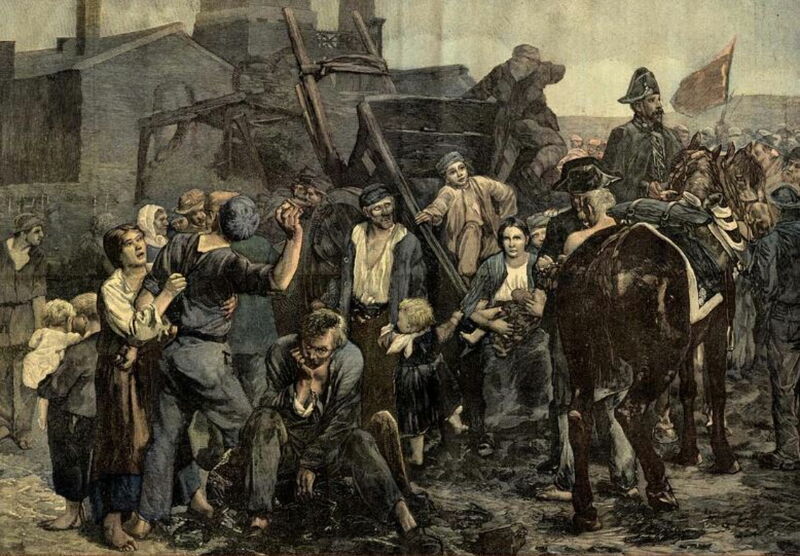 One of the most sinister paintings of strikes during this period is Stanisław Lentz’s Strike (1910). He shows three workers, who are presumably all involved in a strike at the time. At the left is an older man who is singing or chanting his commitment to the workers’ movements; in the centre is a younger worker, his arms folded in his determination not to be moved; at the right is an angry man who looks ready to fight for his rights, his right hand already clenched into a fist and ready to punch. During the late nineteenth century, painters increasingly engaged in social comment. First in ‘social realist’ and Naturalist art ‘for the people’, artists took up the cause of the urban and rural poor, and their struggle to change society. Perhaps populism wasn’t such a bad thing in art after all. Posted in General, Life, Painting and tagged Casas, Koehler, Laermans, Lentz, naturalism, painting, realism, Roll, Uría. Bookmark the permalink. I wonder if there has ever been an artists’ strike. Perhaps illustrators or photographers, but painters, sculptors I am not sure. Thank you – what a fascinating thought. Back in the days of the guilds, things sometimes got quite rough. It wouldn’t surprise me if one or more guilds took some sort of action like that at times. I don’t know of a good history of the guilds in which I might check that, though.